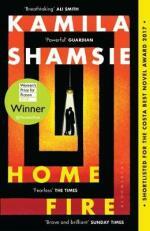 My bookclub discussed this book, Home fire by Kamila Shamsie a couple of nights ago. Thank you, L, for a great choice! Home fire was published in 2017, long-listed for the Man Booker Prize in 2017 and won the Women’s Prize in 2018. It’s a remarkable story, told by five different viewpoints. First we have Isma, 28 years old, a British-born Pakastani woman who is interrogated on her way from London to Massachusetts, where she’ll study sociology. She’d given up her dreams of studying seven years ago when her mother died, leaving her with her twelve-year-old brother, Parvaiz, and his twin sister, Aneeka, to raise. While in Massachusetts, she meets the son of the British Home Secretary, Eamonn. Isma already knows who he is – his father as a MP made a cruel comment to her family about her jihadist father who left when she was young. Isma and Eamonn become friends, but it never develops into the something more that Isma hopes for. When Eamon leaves to go back to London, he ‘arranges’ to meet Aneeka, the beauty of the family. At nineteen, she is studying law. Although she’s initially hostile to Eamonn, she initiates a relationship with him. Eamonn is besotted for a few months, until Anneka tells him she wants his father to allow Parvaiz back into the country. Parvais has spent the last few months in Syria. He was groomed by Farooq, who told him his father was a hero, and that Parvais should try to emulate him. Fatherless from birth, Parvais is an easy target, but struggles to follow the Isis culture. The last two sections are told from Aneeka’s viewpoint, then Karamat Lone, Eamonn’s father. I’m not going to explain any further, otherwise I’ll spoil the story for you! There’s so much sadness in this book. Isma longs for a relationship and then finds out that her sister has what she wants. Aneeka, forever connected with Parvais in their special twin way, feels desolate when he is gone. Parvais’s account of his time in Syria is brutal. I read the ending at the kitchen table, a few hours before our bookclub meeting, and literally covered my face as I read the last page. No spoiler alert here, but be warned! It’s a topical, contemporary book which shows many viewpoints and covers many settings, from London, Pakistan, Istanbul, Syria and the US. It’s based on the Greek play, Antigone, by Sophocleous. In this brief video interview with author Kamila Shamsie, she explains that the heart of the novel is about competing loyalties and loves. It’s an excellent bookclub book because there’s so much to discuss. I’m still thinking about this book days after finishing it. It’s definitely one of my top ten reads for the year! Thanks for reviewing this one Karen. I read it recently and I think it is a story that cries out for discussion and it would be great to have at bookclub. It made me very aware of what a sheltered life I (and this is probably the case for most of us) lead. I never suspected the ending and it was shattering. It was a shattering ending, Shirley. I agree – our sheltered lives protect us from events like the ones that happened in Home Fire. Another book to read. Thank you Karen. Wow, Karen. This sounds an amazing ‘read’ and I will definitely be buying a copy and also recommending it to my book club! I’ll drop it off to you, Ingrid!